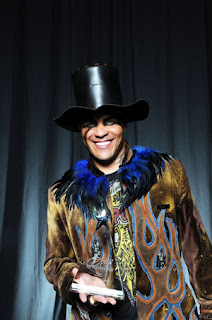 Back in November 2008, TapouT founder Charles “Mask” Lewis Jr was honored as Innovator of the year at the 6th annual Spirit of the Entrepreneur Awards held Wednesday night at the Riverside Convention Center. Before TapouT became the empire that boasts multi-million dollar sales, sponsored fighters and a reality show. Charles “Mask” Lewis Jr and the rest of the TapouT crew started with just few different color t-shirts with the famous TapouT logo, sold them at the Brazilian jiu-jitsu tournaments in southern California and a few years later they are in a number of different stores. Sadly Mask passed away yesterday. The mixed martial arts community lost one of its biggest personalities early Wednesday morning in a car crash in Costa Mesa, Calif.
Charles "Mask" Lewis, the 45-year-old co-founder of the TapouT apparel company, died when he lost control of his Ferrari and hit a lamp pole. Lewis was pronounced dead at the scene. In a statement on its Web site, TapouT said, "It is with heavy hearts and great sadness that we must regretfully confirm the passing of our beloved friend, brother and co-founder Charles 'Mask' Lewis following a car accident that occurred last night. ... Many thanks to all for the outpouring of blessings and well-wishes during this incredibly difficult time." The Los Angeles Times reported that a Newport Beach Police Department officer witnessed the crash and saw Lewis' red Ferrari and a white Porsche spinning out of control just before 1 a.m. Wednesday. The Ferrari then hit the curb and collided into a pole. "It was terrible," Newport Beach Lt. Craig Fox told the Times. "It was extensive damage to the vehicle." A woman in the Ferrari was ejected from the vehicle and was in stable condition at a local hospital. Police haven't determined if she was the driver or passenger of the Ferrari, according to the Times. Police later arrested the driver of the Porsche, Jeffrey David Kirby, and charged him with gross vehicular manslaughter. He was being held on $1 million bail. There was a 50-mph limit on the road, but police believe both cars were traveling well above that limit, according to a report on KTLA.com. The Newport Beach Police Department told FOXSports.com that Lewis' car was a 2004 Modena Ferrari. That Modena can reach speeds of more than 180 mph and retails for almost $200,000. Lewis and Dan "Punkass" Caldwell founded TapouT in 1997 as a clothing and MMA gear retailer. In addition to retail, the private company also signed deals with fighters, including Kimbo Slice, and is a sponsor of fight events. My sincerest condolences to family and friends of Charles Lewis.